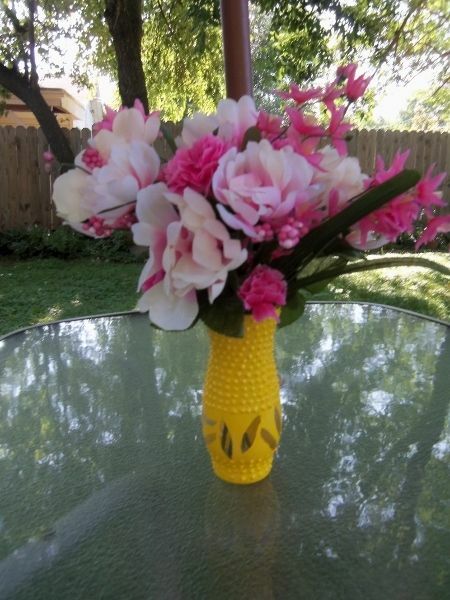 Make your own milk glass vase. Did you ever wonder how hobnail milk glass was made? To be honest, I really never thought too much about the "how to" part but really liked its appearance. 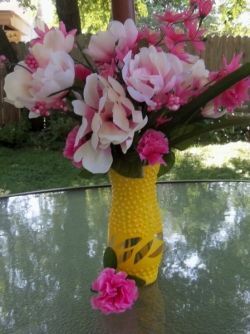 It wasn't until I came across a blog that I saw this project and decided to try making my own version of the classic Fenton milk glass vase. If you're looking for a really easy and inexpensive craft, try making a hobnail milk glass item of your own. You can make a vase Iike I did or something totally different. The main thing is to just have fun. After learning about this craft, read below for more information on the background of milk glass including how it's made, how to recognize a fake, what it is worth and other interesting facts about milk glass. Copyrighted Material by Favored1. Do not copy. Photo credit byFavored1 or Amazon unless otherwise noted. This artwork is licensed under the Creative Commons Attribution-ShareAlike 3.0 License. Before learning about hobnail glass I need to explain what "hobnailing" is in the first place. 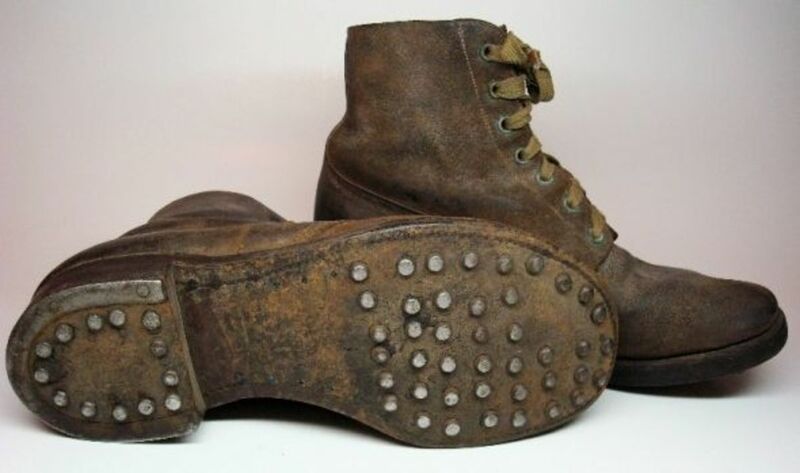 The concept of hobnail glass first came about as a design fashioned after the raised studs or bumps that were often used on the soles of a boot. 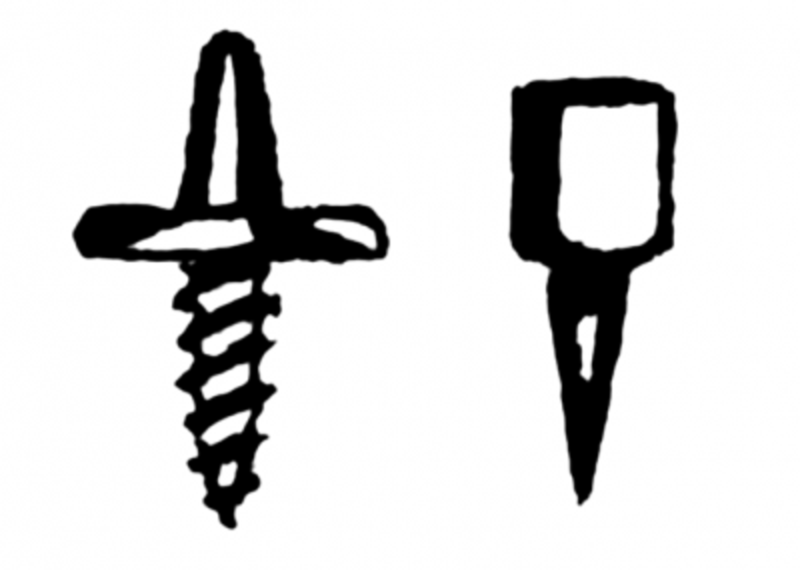 A hobnail is a short nail which has a thick head. It is placed on the bottom of boots so that they can grip better in any terrain. By doing this the boot actually lasts longer. They have been used in the military since WW1. This is exactly like my milk glass fruit bowl. I have used it for so many things over the years including food and holiday items. It also looks pretty just by itself as you can see. Great for decoration purposes, but can also be used for snacks, dried flowers, trinkets, etc. Not to be put in oven, freezer or microwave. Do you have any milk glass? I'd like to have some. This is what a hobnail looks like. There are several ways to achieve this look on glass. Glass crafters make patterns of the raised stud by blowing glass or pressing it into an already designed mold. 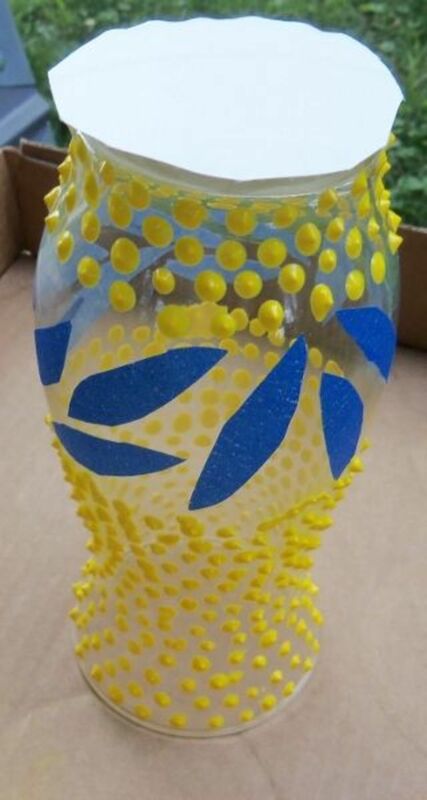 When hobnail glass making was first introduced into the market in 1939 by the Fenton Art Glass Company, it was usually made by using translucent colors. The milk glass version wasn't created until eleven years later and became one of their best selling product lines. 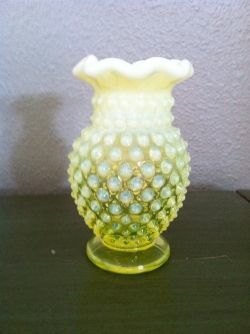 How can you make sure you have a real Fenton Hobnail Milk Glass piece? Every Fenton item has a logo and number on the bottom of it. Under the company name Fenton is a number that coincides with the decade the piece was formed. For example, a piece in the 1980s has the number 8 under it; a 9 represents the 90's pieces. You Need Something to Paint - Decide the size of the vase you want and what it will be used for in your decor. The opening is over 3 inches wide. Products needed for this project. This is a really inexpensive craft, because the paint lasts so you can make several projects. If you don't want any specific design, you won't need the painter's tape. After I already bought the paint the only new thing I had to buy was a vase, and that cost me $1.00. 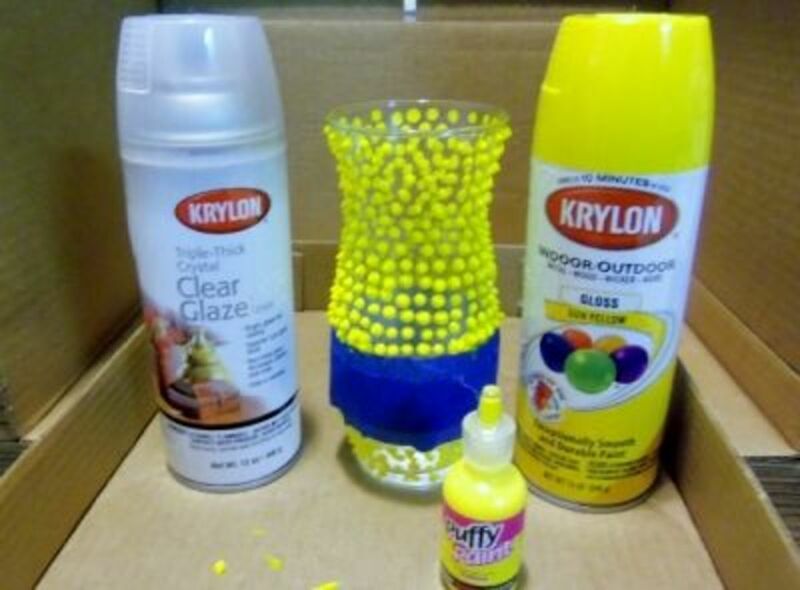 Now Select the Paint - You don't have to make your hobnail milk glass vase white. I made mine yellow to fit in with my kitchen decor. 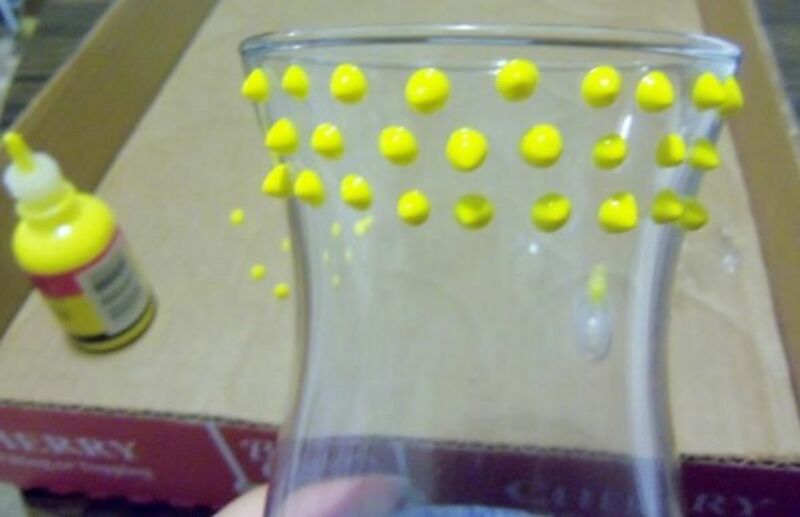 Use puffy paint to make the dots that represent the hob nail part of the project. You will need this paint to seal the puffy paint to the vase. Apply several coats, but dry between spraying. Select a clear vase or container. Step 1 ~ Hobnail Pattern - I wanted a yellow one for my kitchen. You need to begin with a clean smooth piece of plain or clear glass. 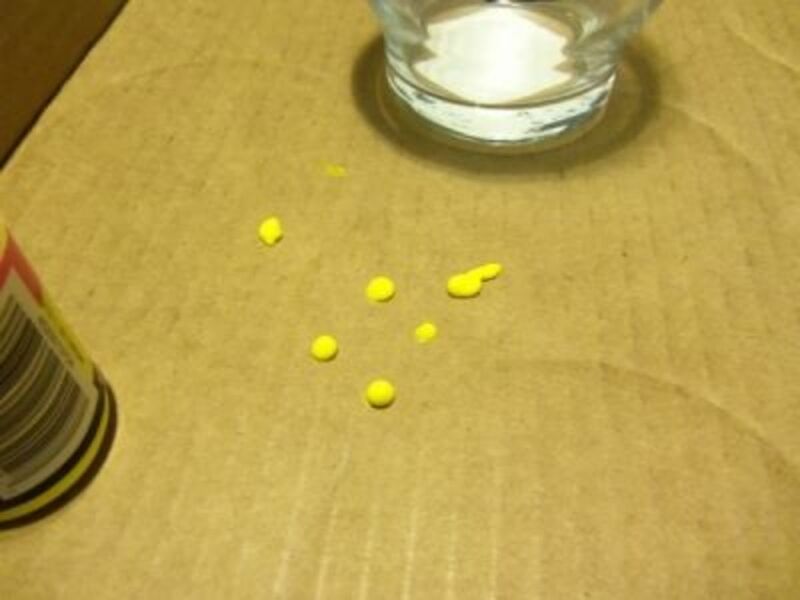 Apply a dab of puffy paint and pull it out so it creates a tip on the dot. It's sort of like decorating a cake. So if you're good at that (I'm not) this will be a breeze for you.I started by doing each section in three's so I could keep a uniform pattern going. This creates the hobnail pattern. I put painter's tape to block off a section I didn't want painted. Dab the tip on cardboard or paper to keep the tip of the paint bottle clean. Step 2 ~ Finish the Pattern - This takes practice to get it uniform. Repeat the pattern until you have completed the entire piece. Space them as evenly as you can. They don't have to be perfect or as close as this is. It took about one half hour to do this.Let dry overnight. As you can see my pattern went a bit random. I'm doing some more pieces so this one is good practice. Don't worry if you get it a little smudged, wipe it off carefully and do it over. If you don't, the smudge will show (No one told me it would, but it does I've learned.). Putting My Design in Action - I took off the painter's tape band, and then cut leaves to position them around the clear part of the vase before I spray painted. 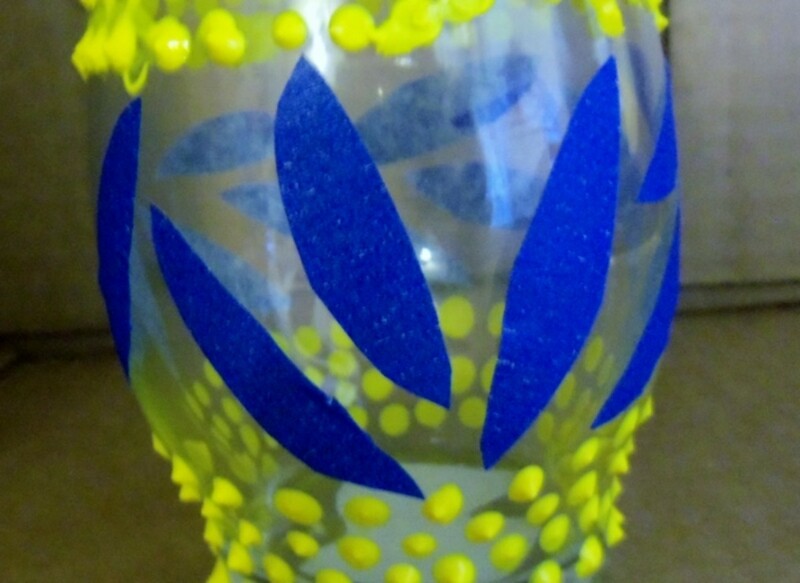 I wanted to be able to see the stems through the bottom of the vase, so I cut leaves out of painter's tape. You can see how I made the leaves turn in every direction for a unique look. I turned the vase upside down and cut a ring out of a paper plate to prevent the bottom from getting paint on it. Mind you, a real hobnail milk glass piece is painted on the bottom. 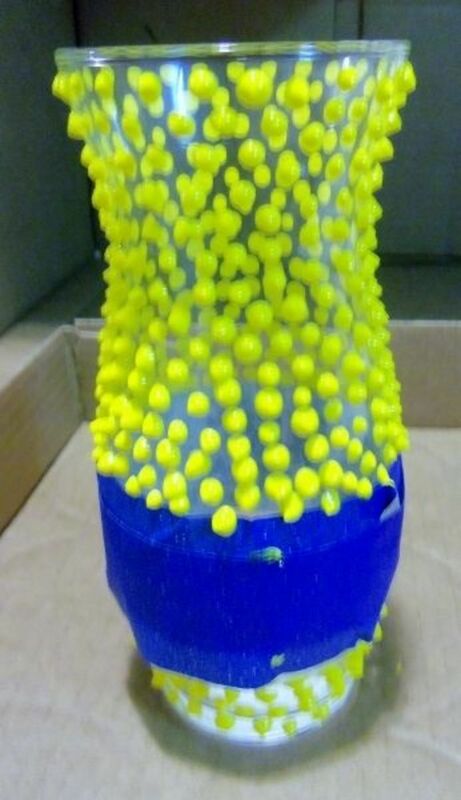 I didn't want to paint the inside of this vase, because I wanted to be able to see through the base. For a true milk glass effect you need to spray the inside as well. Step 4 ~ Clear Coat - Remove the painter's tape before spraying a clear coat. After the colored paint is dry, spray two coats of clear paint to seal and make it shiny. I used Krylon triple thick clear glazing spray paint. The Final Product - So what do you think? Will you make your own hobnail project? Is Milk Glass White Only? No. As a matter of fact it was originally created using various opaque glasses. 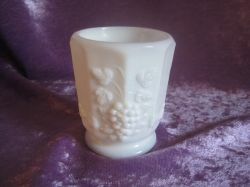 Most milk glass pieces can be identified by the lace or ruffled designs that have been added with the hobnail effect on the main body of the piece. How Can I know if I have real milk glass? - Characteristics of milk glass. That's a good question. Some would like to believe that all white glass is indeed milk glass, but it isn't. Just having a white piece of glass doesn't make it a milk glass piece. What makes it milk glass is the processing that causes a piece to have an opalescent or milky look. It doesn't even have to be white, but can be shades of pink, green or blue. For the most part there are many characteristics that are common to each piece of milk glass. The first thing you should notice is whether or not it is clear. True milk glass is not clear, but appears to be solid all through it. Next you want to look for a glossy shine to it. Look for the whitest pieces you can, they are more valuable. However, don't rule out the colored pieces as being worthless. 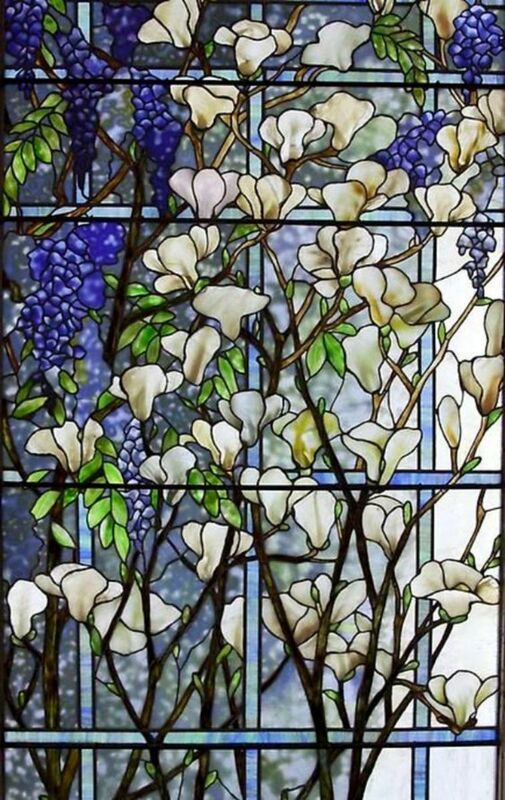 Many manufacturers have put dyes in some of the glass to create exquisite art work that is also worth a great deal to a collector. Do your research for specific design or pattern from previous decades. 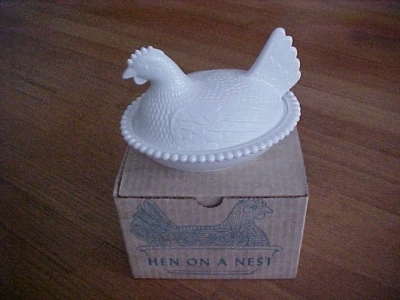 The market used milk glass for many things besides dishes. Look for figurines, dessert dishes, serving dishes, lamps, vases, baskets and more items that had specific designs on them for that time period. What Makes the Glass White? In order for the clear glass to become white, it has to be altered. While the glass is still hot during its making the manufacturer has to add oxides or ash to it which causes the glass to change color. Good milk glass is "darker" white or richer white. In other words it doesn't look washed out, but appears as if it were solid through and through. Early milk glass patterns of decorative dishes. It's obvious that milk glass is called that because of it looks like milk. But how do I know if the milk glass I have is a valuable one? Look for these things when estimating the worth of your item:1. You need to determine when your piece was probably made. The farthest pieces date back to the 1840s, so of course this would make these pieces the most valuable. Pieces created in this time period usually had a pattern of block and fan, button or arch. They did have holiday pieces that had specific themed patterns like grapes or holly for Christmas, patriotic themes using stars and stripes. The whiter the piece the higher the value. 2. Earlier pieces were not true white. They were made with arsenic, which made the milk glass dull instead of bright. 3. 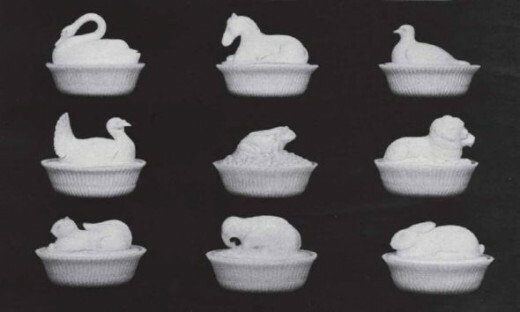 Animal figurines along with fancy party ware like cake pedestal dishes or covered candy dishes were introduced in the 1880's. 4. 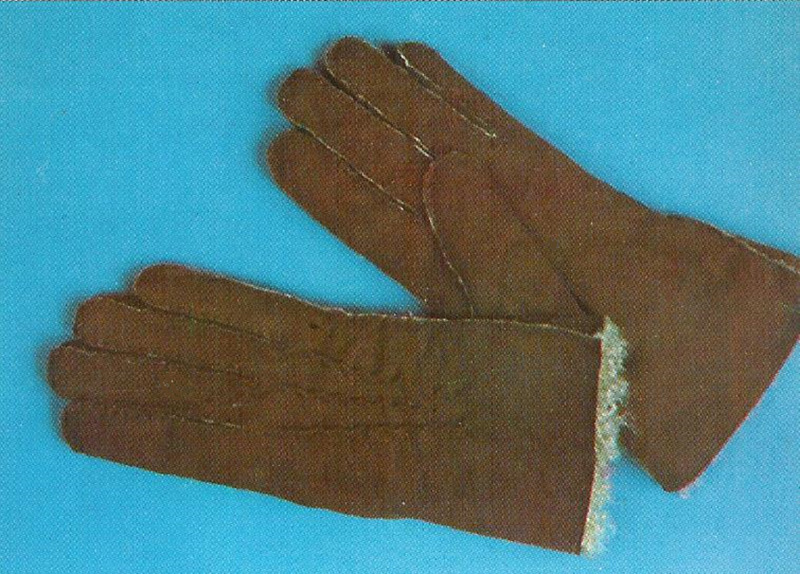 Pieces that were made during any wartime are valuable, because new patterns and colors were introduced. 5. Research through books, online shops and certified appraisers. Many of these resources have photographs that will help you identify your piece. Not all glass is equal when it comes to recognizing milk glass. White glass doesn't qualify the piece as milk glass. There are certain characteristics that determine whether a glass is simply glass that is white or milk glass.For glass to be classified as milk glass it has to go through a process that oxidizes the glass while it is still hot. This gives the glass a milky appearance. Look for these names or words when searching for authentic milk glass: Monax, vitrock, Fire King, Fenton, and Silver Crest. It may be a design or word printed inside the piece or on the bottom with a letter or number. Regular white glass was first used for things like lights and can be identified by the Monax pattern. This is when the glass was made to be thin and almost transparent to let light through. 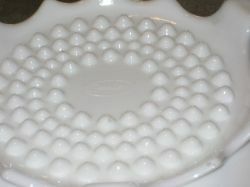 Designs were pressed into the glass with molds creating scalloped edges on the rim. Original milk glass almost looked like a quilt or checked pattern. They appear to have ripples in them, but they are put into the design on purpose. You will find early pieces with specific engravings of either a "W" or "G" printed on the bottom. Be cautious. Some white glass companies have also put their letter mark on the bottom of their designs, but don't be confused thinking they are milk glass. Some of these pieces are white china. 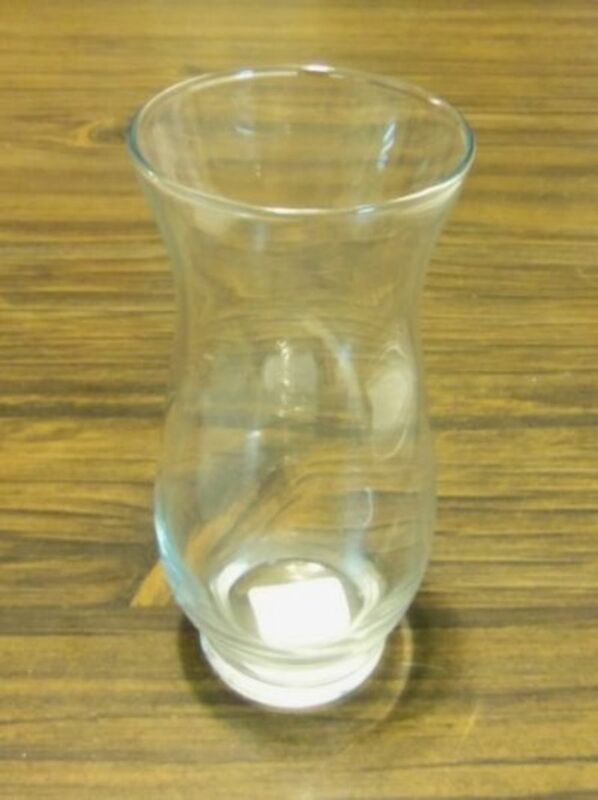 Milk glass is thicker and heavier than regular glass. It is also shinier. White glass is also easily recognized if it has directions that it can be placed in an oven, microwave or freezer. Milk glass cannot be used in any of these ways, but is mainly for decorating purposes. If you aren't sure look for an appraiser who can give you guidance on your piece. This is where I first saw this project and decided to make one of my own. 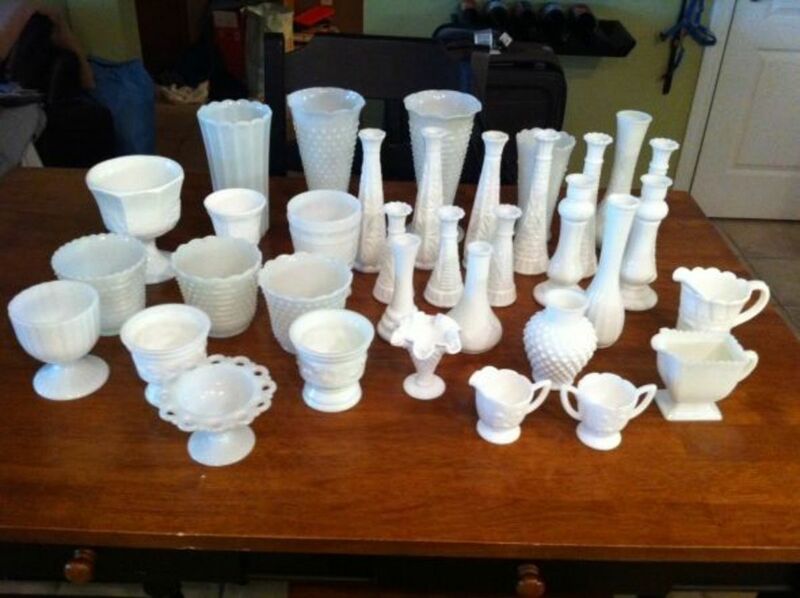 Resource for identifying fakes and reproductions of milk glass. Information on the original hobnail milk glass. Check out this week's challenge on my Daily Favor Blog. Did you learn something new? - Thanks for visiting. Leave a comment or just say Hi. 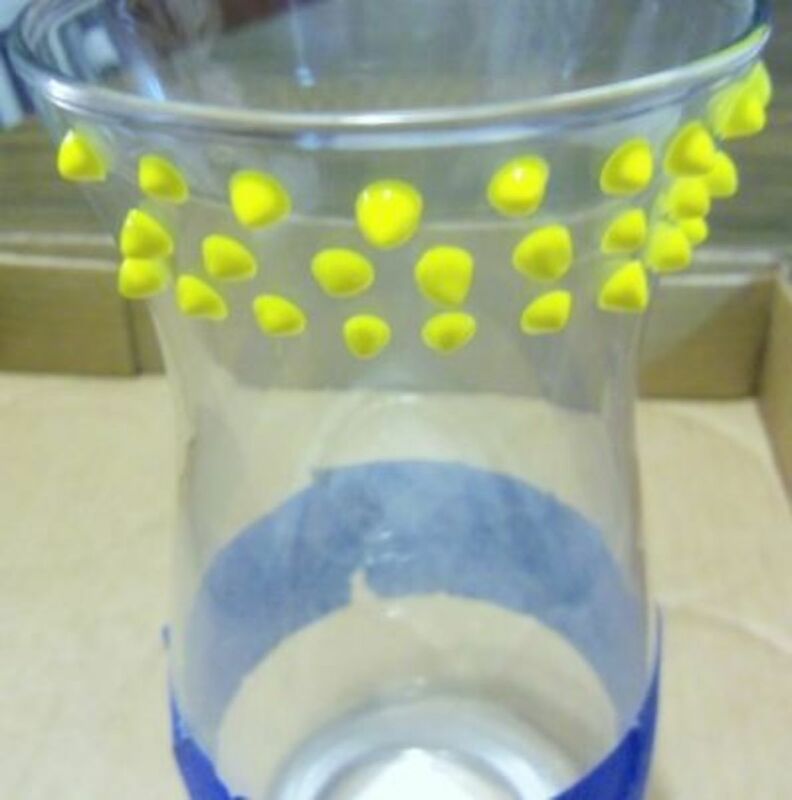 Brilliant idea of making your own hobnail vase. It looks very pretty. I used to collect milk glass but gave them up when we moved. Wednesday-Elf I really enjoyed this craft. I plan on making more in other colors as well as the traditional white. Thanks for visiting. I never thought about the story behind milk glass and would not have imagined you could make your own hobnail piece. Very interesting article and tutorial. Thanks Elsie Hagley. I really did like making this and want to make more in different colors. It's so easy and makes a nice gift. Pam Irie is really isn't that hard and the end results were satisfying. I hope to make some more in different styles and colors. Thanks for visiting. I appreciate it. Interesting Hub. I know what Hobnail boots are although I haven't seen any for years now.You have certainly made a vase that looks like hobnails, very cute. You did a great job explaining how it is done. Thanks. I have several pieces of milk glass that I've collected, but had never thought of trying to make the hobnail design. You did a great job! @Christine Dever: I hope you find some wonderful treasures! Very interesting! I think my mum might have a milk glass vase/jug. I never thought that it was anything special, except that it looked nice. I'll have to check and see if it has any of the marks you mentioned. @takkhisa: You absolutely could. It was a fun project I will do again in the future. The milk glass vase you made is beautiful and it sounds like I could try it at home! Thank you for sharing this great lens. This is such a great effect - I love the vase you made :) very clever - you really deserved the purple star! @Susan Zutautas: It was fun and I'm doing another one. Wow I never knew you could do this and it's something I'd love to try. @Zeross4: Something to make with your kids when they get a little older. Thanks for visiting Daisy. @BLouw: Nice to see my France friends. You can make this easily and I'm sure it would be fabulous. Yes, I did learn something new. I'd never heard of milk glass let alone hobnail milk glass. I'm so pleased the title caught my attention. 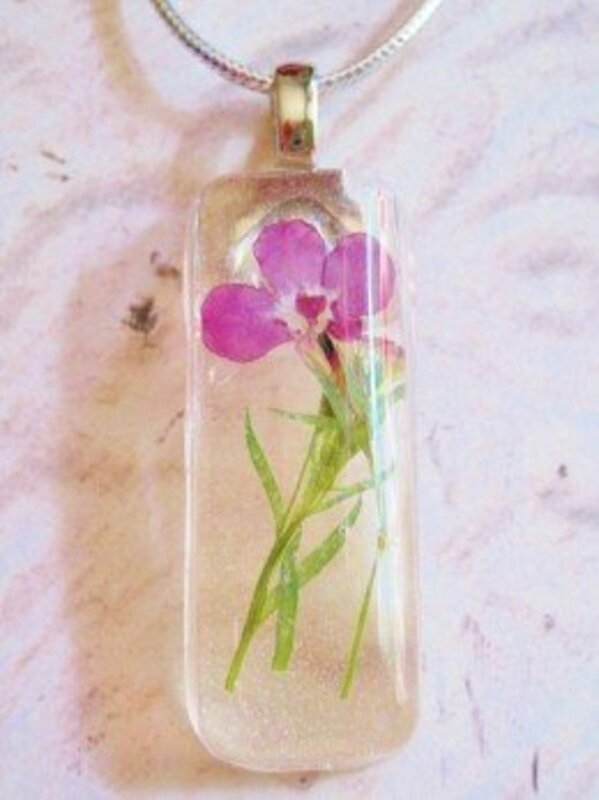 How very enterprising of you to make your own vase! @Sylvestermouse: I know you could be really creative with this idea Cynthia! What a really cool and creative idea! I absolutely love it! @KerryVor: It doesn't take much time and is rewarding. Hope you get a chance to make one. @Marcel W: I appreciate that. It was nice of you to visit. Very nice, thorough lens on a unique topic...well done! This is really interesting and funny. I wont try it but will send the link to some of my friends that Im sure will become followers. Nice lens indeed! I never would have thought of doing this. I love hobnail milk glass and have some myself. Yes, I did learn something. Your vase came out amazing! Great job on this lens. @NC Shepherd: I know it isn't the traditional look, but I wanted to try something different. 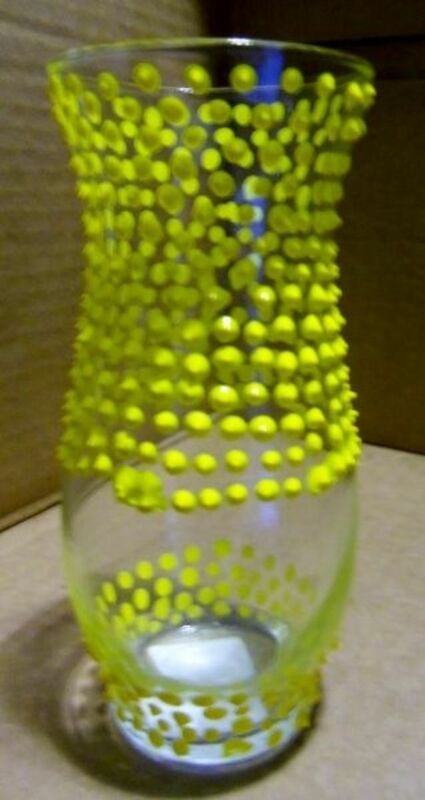 My next pieces will be like a regular hobnail glass vase. @Rhonda Lytle: You're pretty creative yourself. This would be easy for you. @flinnie lm: Thanks, I'm trying white next time round. @Lorelei Cohen: I saw it on the web somewhere and decided to try it myself. You could do it Lorelei with no problem. Nice seeing you. @aka-rms: Thanks, I appreciate it. @Margaret Schindel: Thank you. I appreciate your visit. Never thought to make my own hobnail pieces. I like the way you made the see-through leaves on your vase. Awesome directions and final product. Most impressive. I have to try this. Hi what a fun craft, I love the vase you made. It look good. Saw your comment and found this link in the guestbook at the quest lens so I added you to the leaderboard there. Don't know why it wasn't in with the others that were submitted. Must have been a glitch. 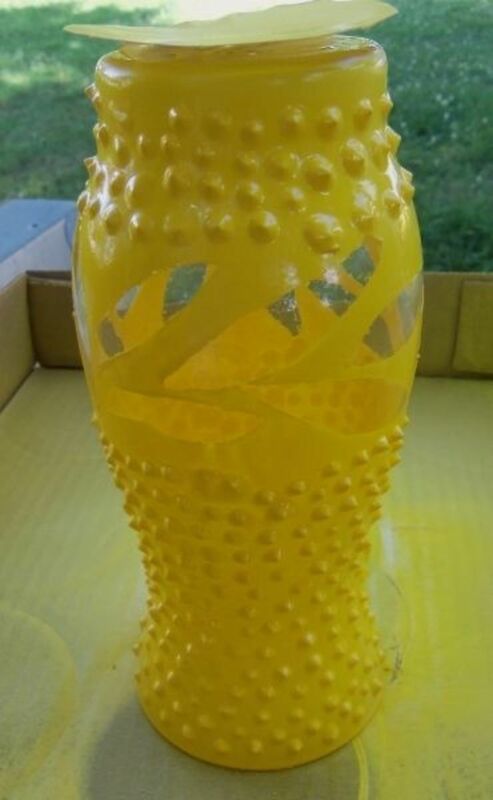 Oh my - what a clever way to create a faux hobnail glass effect! Your vase came out beautifully. 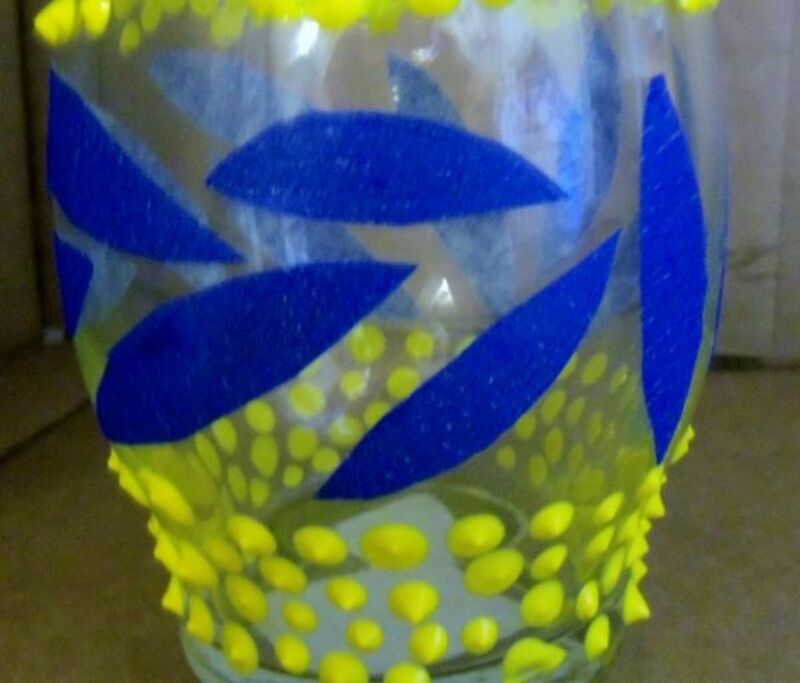 Wonderful instructions, photos, and information about hobnail glass. Congratulations on your well deserved purple star, Fay! A cool lens. My ex-wife got my Fenton Milk Glass. Oh you are very patient and crafty. I would never have imagined being able to make hobnail glass. You make it look so easy too.